One of the most attractive features of the Shih Tzu breed is its long flowing fur. However, long fur is one of the most troublesome aspects of keeping a Shih Tzu. 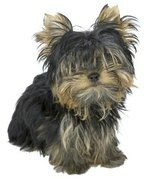 Ungroomed fur becomes tangled and matted, leaving your dog dirty and uncomfortable. Fortunately there are a number of hair cuts and styles that can make dealing with your pet's fur a lot easier. There are a number of different hair cuts and styles you can give your Shih Tzu. This dog has his body hair shaves, and his head hair clipped short. The easiest hair cut to give your Shih Tzu, and the most thorough, is to shave off the hair on its legs and torso. Use a pair of clippers to trim the hair on its head, sides of its face and ears. Hold its tail and shave off the hair from the sides. This is a good hair cut for Shih Tzus that like to chew on their fur and for dogs living in hot climates. Shaving the torso and neck will help to cool the dog in the summer. You can make grooming your Shih Tzu easier by shaving off the fur from its torso and neck and leaving the remaining fur long. This is a way of cooling off your Shih Tzu during the summer months and cutting down on the time needed for grooming without shaving off everything. Some cuts can give the dog a lion like appearance. This is similar to the hair cut discussed in Section 1, except the Shih Tzu's defining features — its facial fur — are left untouched. The tufts of fur on its legs and tail are trimmed a little bit. This makes the dog look like a lion. Long hair requires frequent grooming. If you want to leave your Shih Tzu's hair long, a lot of grooming and styling is still necessary to keep your dog clean and comfortable. The Shih Tzu needs to be cleaned and combed regularly to keep its fur from matting. Bows or ribbons can be tied to the long tufts of fur above its eyes, keeping the fur out of its eyes and giving the dog a groomed appearance.